ARIES (March 21-April 19):”If Taylor Swift is going to have six breakups a year,” observed comedian Bill Maher, “she needs to write a new song entitled ‘Maybe It’s Me.’” He was referring to Swift’s habit of using her romantic misadventures to stimulate her lyric-writing creativity. With that as your prompt, Aries, I’ll ask you to do some soul-searching about your own intimacy issues. How have you contributed to the problems you’ve had in getting the love and care you want? What unconscious behavior or conditioned responses have undermined your romantic satisfaction, and what could you do to transform them? The next eight weeks will be prime time to revolutionize your approach to relationships. 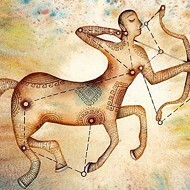 TAURUS (April 20-May 20): Philosopher Alan Watts used to talk about how the whole world is wiggling all the time. Clouds, trees, sky, water, human beings: Everything’s constantly shimmying and jiggling and waggling. One of our problems, Watts said, is that we’re “always trying to straighten things out.” We feel nagging urges to deny or cover up or eliminate the wiggling. “Be orderly,” we command reality. “Be neat and composed and predictable.” But reality never obeys. It’s forever doing what it does best: flickering and fluctuating and flowing. In accordance with astrological omens, Taurus, I encourage you to rebel against any natural tendencies you might have to fight the eternal wiggle. Instead, celebrate it. Rejoice in it. Align yourself with it. GEMINI (May 21-June 20): Author Elaine Scarry defines “the basic impulse underlying education” as follows: the “willingness to continually revise one’s own location in order to place oneself in the path of beauty.” Consider making this your modus operandi in the coming weeks, Gemini. Always be on the lookout for signs that beauty is near. Do research to find out where beauty might be hiding and where beauty is ripening. Learn all you can about what kinds of conditions attract beauty, and then create those conditions. Finally, hang around people who are often surrounded by beauty. This approach will be an excellent way to further your education. 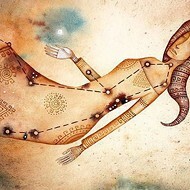 CANCER (June 21-July 22): “Life is either always a tight-rope or a feather bed. Give me the tight-rope.” So declared writer Edith Wharton. But she was an Aquarius, and more temperamentally suited to the tight-rope. Many of you Cancerians, on the other hand, prefer to emphasize the feather-bed mode. I suspect that in the next nine months, however, you will be willing and even eager to spend more time on the tight-rope than is customary for you. To get primed for the excitement, I suggest you revel in some intense feather-bed action in the coming weeks. Charge up your internal batteries with an extra-special deluxe regimen of sweet self-care. LEO (July 23-Aug. 22): Half of a truth is better than no truth at all, right? Wrong! If you latch on to the partially accurate story, you may stop looking for the rest of the story. And then you’re liable to make a premature decision based on insufficient data. The better alternative is to reject the partially accurate story and be willing to wait around in the dark until the complete revelation comes. That may be uncomfortable for a while. But when the full truth finally straggles in, you will be very glad you didn’t jump to unripe conclusions. VIRGO (Aug. 23-Sept. 22): A Chinese entrepreneur named Nin Nan dreamed up a unique way to generate capital: He sold dead mosquitoes online for a dollar apiece, advertising them as useful for scientific research and decoration. Within two days, he received 10,000 orders. Let’s make him your patron saint and role model for the next few weeks, Virgo. May he inspire you to come up with novel ways to stimulate your cash flow. 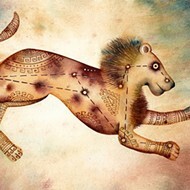 The planetary omens suggest that your originality is more likely than usual to generate concrete rewards. LIBRA (Sept. 23-Oct. 22): “The most important thing is to find out what the most important thing is,” wrote Shunryu Suzuki in his book Zen Mind, Beginner’s Mind. That’s your assignment for the next three weeks. Do whatever it takes to find out beyond any doubt what the most important thing is. Meditate naked an hour a day. Go on long walks in the wildest places you know. Convene intense conversations about yourself with the people who know you best. Create and sign a contract with yourself in which you vow to identify the experience you want more than any other experience on earth. No waffling allowed, Libra. What is the single most important thing? SCORPIO (Oct. 23-Nov. 21): Sometime in the next nine months you may feel moved to embark on an adventure that will transform the way you understand reality. Maybe you will choose to make a pilgrimage to a sacred sanctuary or wander further away from your familiar comforts than you ever have before. Right now is an excellent time to brainstorm about the possibilities. If you don’t feel ready to actually begin your quest, at least formulate a master plan for the magic moment when you will be ripe. CAPRICORN (Dec. 22-Jan. 19): Have you been getting enough? I doubt it. I think you should sneak a peek into the hiding place where your insatiable cravings are stored. If you’re brave enough, also take a look at your impossible demands and your unruly obsessions and your suppressed miracles. Please note: I’m not suggesting that you immediately unleash them all; I don’t mean you should impulsively instigate an adventure that could possibly quench your ravenous yearnings. But I do believe you will benefit from becoming better acquainted with them. You could develop a more honest relationship, which would ultimately make them more trustworthy. AQUARIUS (Jan. 20-Feb. 18): Don’t tape your thumbs to your hands and stalk around pretending to be a dinosaur. Don’t poke three holes in a large plastic garbage bag and wear it as a tunic while imagining that you are a feudal serf in a post-apocalyptic, sci-fi dystopia. Don’t use a felt-tip marker to draw corporate logos on your face to show everyone what brands of consumer goods you love. To be clear: I would love you to be extravagantly creative. I hope you will use your imagination in novel ways as you have fun playing with experimental scenarios. But please exercise a modicum of discernment as you wander way outside the box. Be at least 20 percent practical. PISCES (Feb. 19-March 20): “Take a lover who looks at you like maybe you are magic,” says the poet Marty McConnell. That’s good advice, Pisces -- not just in regards to your intimate relationships, but about all your other alliances, too. If you’re seeking a friend or consultant or business partner or jogging companion or new pet, show a preference for those creatures who look at you like maybe you are magic. You always need to be appreciated for the sweet mystery and catalytic mojo you bring to your partnerships, but you especially need that acknowledgment now.